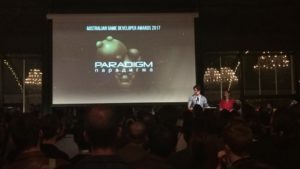 Two West Australian titles win at the Australian Game Developer Awards! Published on October 30, 2017 in News. 0 Comments Tags: AGDA, Australian Game Developer Awards, awards, Battlestar Galactica Deadlock, Black Lab Games, Jacob Janerka, Paradigm. 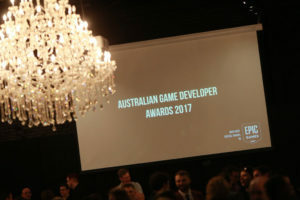 Walking onto the stage to great applause, two of the nine winning titles at the 2017 Australian Game Developer Awards (AGDAs) were from Western Australia. 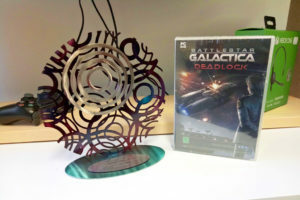 Congratulations to Black Lab Games, who won an award for Battlestar Galactica Deadlock (pictured above), and Jacob Janerka with a win for point-and-click adventure Paradigm! We would also like to give a special mention to another excellent local title that was nominated; Symphony of the Machine by Stirfire Studios. 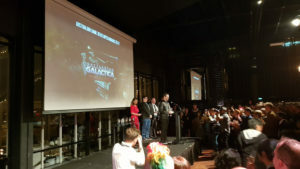 The AGDAs even got a mention on game news site Kotaku; feel free to check it out for details on all the other wonderful winners. You can also peruse the #AGDA17 feed from the night on twitter, as well as feast your eyes on photos of the event below as shared by Melbourne Int Games Week, Black Lab Games, Jon Hayward, and Jonny Roses. Published on April 24, 2017 in Releases. 0 Comments Tags: Jacob Janerka, Paradigm, Steam. Sliding onto Steam earlier this month, the locally-made Paradigm is pulling in rave reviews thanks to its unique humour and phat beatsies. Created by Jacob Janerka after a successful Kickstarter, the high praise heaped upon it so far includes a 9/10 from Destructoid, 9/10 from Press Start, and an 8/10 from IGN. Paradigm is as traditional a point-and-click as I’ve played in a while, with a design, structure, and sense of humour that wouldn’t feel out of place in the genre’s heyday of the early ‘90s. Channelling the anything-goes spirit of LucasArts and Sierra’s comedy classics like Sam n’ Max Hit the Road and Space Quest with a touch of the truly surreal, it presents a fun story that I won’t soon forget. Because hey, a talking sloth named Olaf wearing a Trump-like toupee that vomits candy bars is inherently unforgettable. So if hanging out with handsome mutants like Paradigm sounds like your kind of thing, simply head on over to Steam and let the point-and-click adventure begin. The Let's Make Games archives for the jacob-janerka tag.